Suessen will show the latest applications at ITMA Asia. The exhibition is held in Shanghai from October 15 to 19, 2018 at the National Exhibition and Convention Center. Suessen will welcome interested visitors in hall 1, booth D01. As the leader in compact ring and open-end rotor spinning technology, the company will demonstrate the competence in handling and processing natural and man-made-fibres, focussing on efficiency and profitability in the spinning processes. The new EliTe®: The world’s leading, most utilized and versatile compact spinning system with new innovative components further boosting productivity and yarn quality. For existing installations, Suessen offers upgrade packages to enable the customers to participate in the benefits of the latest developments and innovations. The new EliTe® will be displayed on a Rieter ring spinning machine. The EliTwist®Spinning System combines compact spinning and twisting of a plied yarn in one single production step, representing the most economical way to produce two-ply yarns. 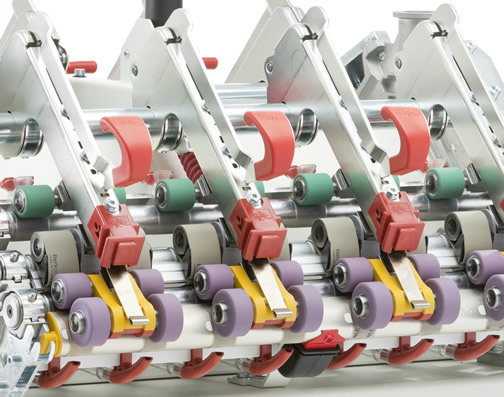 The HP-GX Top Weighting Arms for short staple, roving and worsted spinning machines are equipped with finely tuned heavy-duty plate springs for frictionless load transmission. The HP-GX 3010 in combination with ACP Quality Package (Active Cradle with PINSpacer NT) reduces IPIs in cotton spinning up to 60% and Uster CV% up to 15%. It is the most suitable arm to replace the existing systems on ring spinning machines, while the given top roller equipment may be reused. Premium Parts: Spinning components, spare parts and modernization packages for rotor spinning machines such as ProFiL®Rotors, ProFiL®Navels, SOLIDRINGs, PS7 TwinDiscs are most precisely manufactured to guarantee homogeneous yarn quality throughout the complete machine in order to ensure flawless textile fabrics. A detailed overview about the full product range of Suessen can be found under www.suessen.com.